With both feet still on the assisting steps of the dip machine, position your back firmly against the vertical pad. Firmly grip the hand grips while positioning your elbows on the elbow pads at a 90 degree angle, carefully remove your feet from the assisting steps (you should now be suspended in the air), and push your body firmly against the vertical pad with your arms. Slowly raise your knees up as high as possible/comfortable (ideally they should nearly reach your face), exhaling throughout the movement. Slowly lower your knees back down until they are perpendicular with the ground, inhaling throughout the movement. Performance Variation: Target the upper abdominals even more by reducing the range of motion. 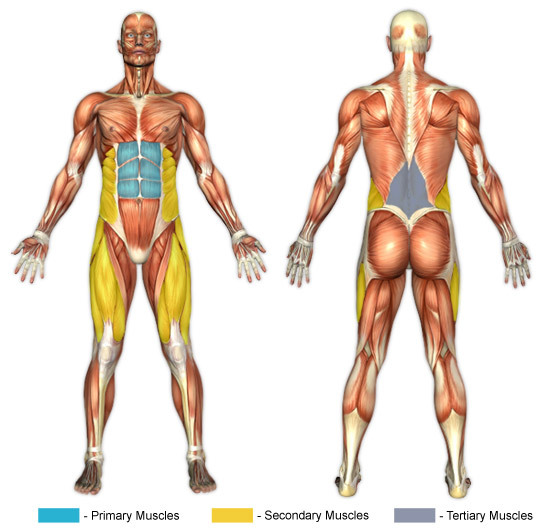 By performing only the top portion of the aforementioned prescribed movement for this exercise (i.e. by performing your raises from the point your knees are horizontal and up), your upper abs will receive a more focused and intense workout. Knee raises are a fine exercise for those who are just starting an abdominal routine. The utilization of hand grips on each side of the dip machine (which alleviates some of the work that the abdominals must do to raise the knees by introducing the ability to use other muscles to share the work load), as well as having a back-rest to eliminate body sway, make this exercise a great choice to start doing some abdominal work. Vertebra compression is a common problem that can arise at the bottom motion of this exercise. Be sure to control the lowering motion so that your legs don't swing behind you; doing so will greatly reduce the chance of injury.